Vendors & researchers, no more decade old embargo! Vulnerabilities reported ten years ago, they have no impact on your customers. If they do, then you are woefully behind and your customers are desperately hanging on to legacy products, scared to upgrade. For vendors who have kept up on security and adopted a responsible and timely manner for handling security, open up your records. Share with the world the ten or more year old vulnerabilities. 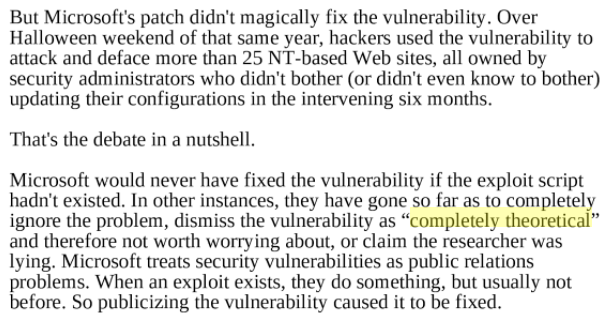 Let the security community get a better picture of the real number of vulnerabilities reported to you, specifically the ones that never appeared in your advisories. This includes off-beat denial of service crashes, difficult to reproduce memory corruption, silly issues that required some level of access to begin with and everything else. Some researchers have begun to do this, sharing more details of older disclosures that had vague details. Simple Nomad posted earlier this year about several old bugs as well as cleared up some confusion (via e-mail) regarding the old Palmetto FTP vulnerabilities.